I love beans. Chips beans and sausages played an integral part of my late teenage years mucking around in Donegal with reprobate mates of mine. This is something of a development of that – the adult version I suppose and instead of the old one being followed by 10 cans of Dutch Gold this goes better with a deep red wine. 2 good Pork chops – the thicker the better – bone on. Get the beans going first. Onions and garlic into a hot pan and saute for a few minutes. Add the tomato puree and cook out for a minute. Add the wine and reduce then in with the drained beans and chopped tomatoes – lower the heat and let the beans cook for at least 20minutes – throughout this process you can add the stock to keep everything moist. Season with the chili, again to you own tolerance….or madness and finely chopped rosemary. Keep tasting as you cook until you are happy with the flavour – salt, garlic, chili, pepper etc, etc – develop as you cook. While that’s going on make the slaw – just mix the slaw ingredients together in a bowl. This is the counter balance to the spicy beans so again regulate as you go – taste the beans then taste the slaw, see how they interact and fiddle with accordingly! When the slaw is done sling it in the fridge as you want it cold. 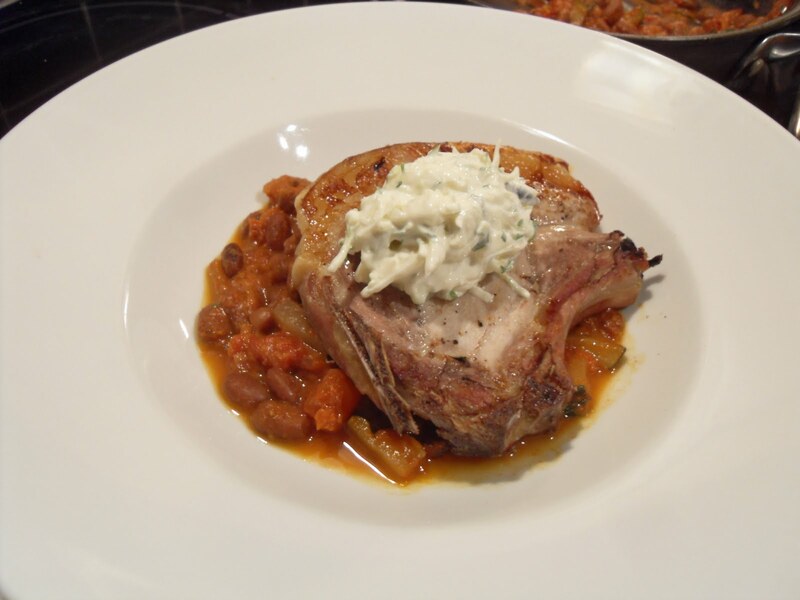 Season the Pork with salt only – all the weird and funky flavours come from the beans and slaw, you want the pork to taste of Pork meaning you have 3 things in the final dish: Spice, Meat, Freshness. Arrange as you feel like on a great big white plate – or even better on a terracotta dish.